We were fortunate to happen upon a dream Door county sunset over the waters of Green Bay. 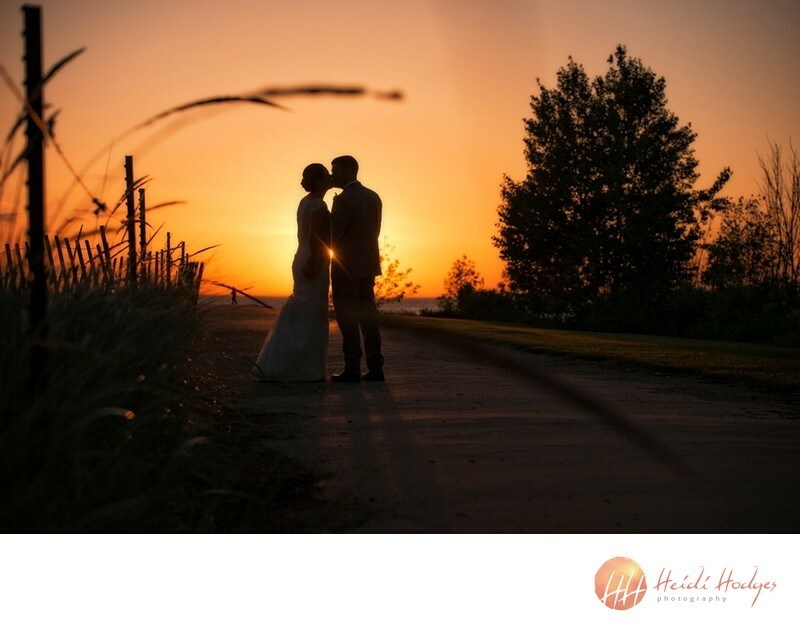 The couple left their Horseshoe Bay reception (in Egg Harbor, Wisconsin) to go to next door Murphy Park, and take a stroll down the pier and beach in the warm summer air, to watch the setting sun amid beach grass and sandy dunes. Horseshoe Bay is one of Door County's premier wedding venues, with fabulous facilities, food and views. There are even on-site ceremony locations, so you can stay right on site for the entire event. This couple traveled around a bit using Door County Trolley to transport the couple and wedding party to photo locations prior to the ceremony. After the afternoon ceremony, the couple did family photos and moved to their cocktail hour. That's a great reason to do a "first look" ceremony earlier in the day, so all the wedding party and "couple" photos are accomplished prior to the wedding, when everyone is fresh, and hair and makeup are at their best. Even though we had a great pre-ceremony session, we still managed to sneak away for sunset photos. And it could not have been more beautiful--more Door County--than those moments at the peaceful beach. Location: 7119 Bay Shore Drive, Egg Harbor, WI. 1/2500; f/4.0; ISO 250; 70.0 mm.